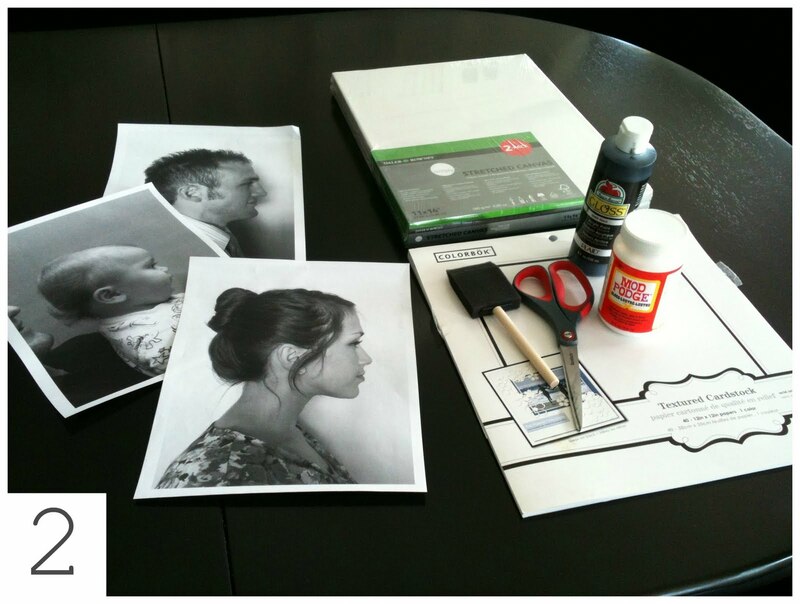 With paint brush #1 quickly spread a thin layer of Mod Podge onto the back of the pictures. Then press onto the card stock/scrapbook paper. Cut out silhouette (this is my favorite part:) BE SURE to get all the details!...hairs, eyelashes...and be careful with trimming and cutting too far into the face/head, it's like a wig: you can always cut a little more, but you can't make it grow back if you've gone too far. 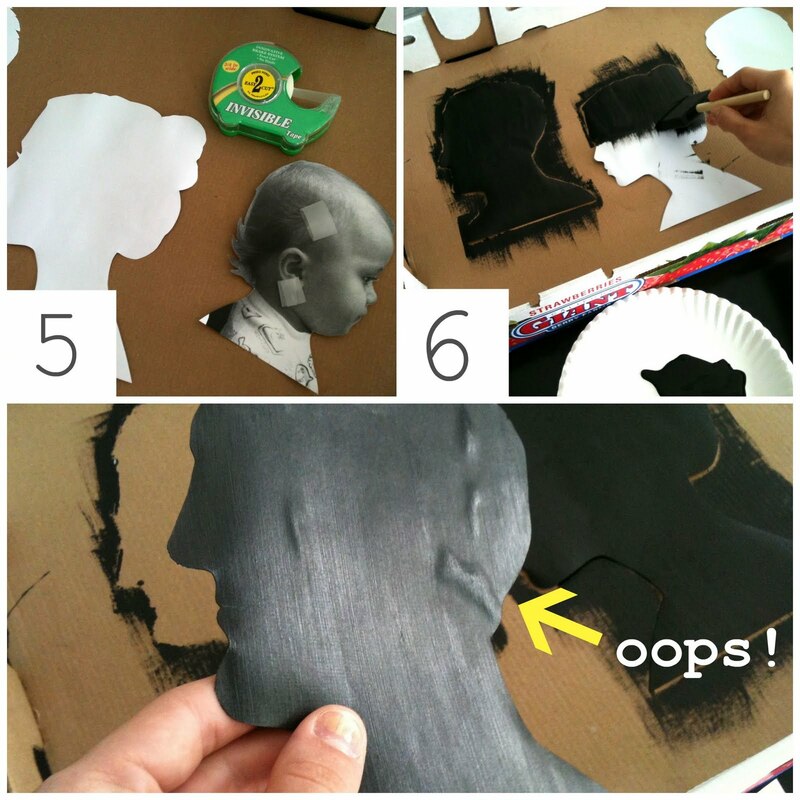 Use tape to secure photo to a painting surface (in my case, cardboard) so that you won't have to touch it and smudge the paint. Use paint brush #2 and paint! Be sure to do TWO LIGHT LAYERS (let the 1st one dry)...otherwise it will bubble like the 3rd photo (I re-did that one, only took a few minutes:)...and make sure the paint strokes are all vertical. Let fully dry. Put a book under your canvas (if it's framed and hollow in the back) so that you have a hard surface to press the painted silhouette onto. 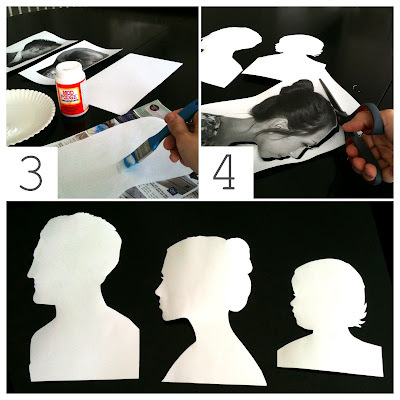 Use paint brush #1 and quickly spread Mod Podge onto the back of the painted silhouette. 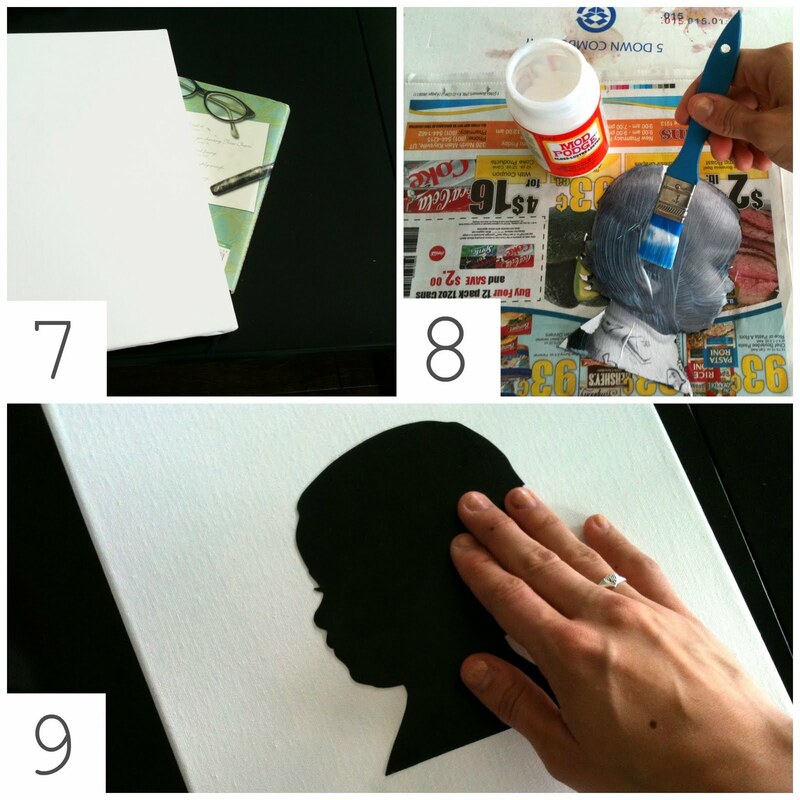 Center/place silhouette on canvas, press and smooth with hands. Ta-daa! Display your beautiful silhouettes and enjoy! I wasn't sure if they'd really look like us, but they do :) and we love them! Go see what other projects, ideas, and recipes people have been working on! Oh I love it! 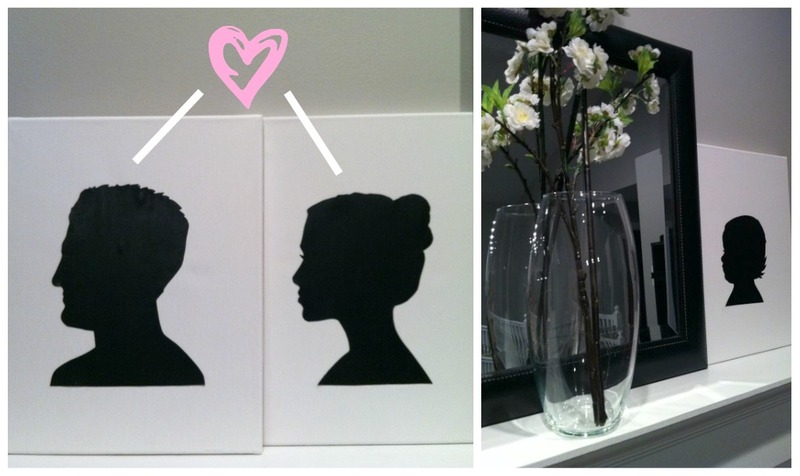 Silhouettes are so classy! they look exactly like you guys! way to go :) love it! Love it, I'm going to make my doggys pose. HA! I have been itching to do this for a while...I will need to give it a go. For serious...I need to get motivated. You always have the best and fun ideas!! Now you can add this: Watermelon milkshakes- a bunch of watermelon and vanilla ice cream and blend it up! Be sure to put a lot though and maybe even add milk? super easy and delicious! Wow - I love these! Yours look awesome, and you have such a pretty silhouette! And I love Brook's little curly hair..so cute! This is so cute! 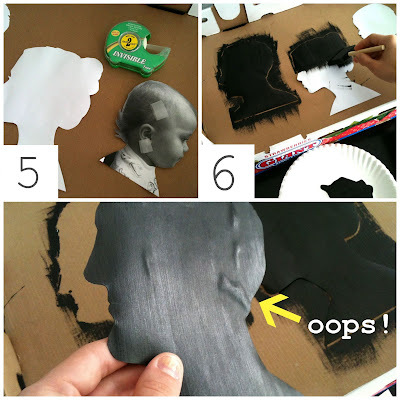 You are so creative and crafty! 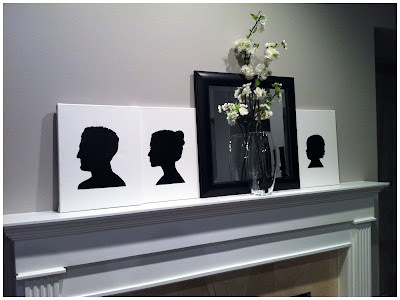 Now I wanna do this for the living room in our new place! OH MY GOSH! 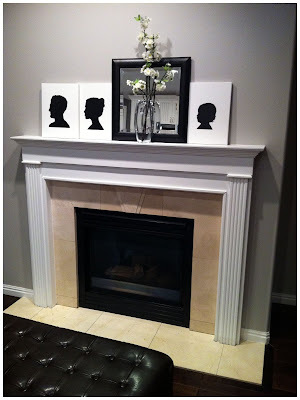 I'm in love :D what an amazingly easy craft and it turned out SO good. awesome job girl! SO cute!! love your crafts! your turned out amazing. The Iguana was wonderful, it was like chicken but much better. I wish I could buy it at the store. I love being blog friends! I love it! Those are so cute. I wanna do mine asap! Cute! Holly and Andy just did this too!! YES- they totally look like you guys, I love them! I have always wanted to do these so thanks for much for the tutorial! What an awesome tutorial, thank you! If I ever have a free minute, I will be all over this! And can I just say, you have a most beautiful profile! Oh my goodness...I am overwhelmed by cuteness and creativity! You are so awesome!! I would love love love to do this sometime! I am dying over Brooks' little silhouette...imagine how sweet it will be when he's older and can look back on his little baby profile that mommy so lovingly recorded in a beautiful silhouette! Aww. So glad you posted this! I was actually googling the Steph Nielson ones and yes, nowhere to be found. I'm glad I was sent over to this fantastic blog! BTW, I haven't made these yet, but I could swear that Nienie just painted the actual printed picture and skipped the entire transfer step. I'm going to try that first.